It’s a pretty well-known fact that South Nashville and the Antioch region have fallen on hard times in recent years. One just has to look at the vacated Global Crossing Mall to witness the proof. But, in the past year local housing prices have increased dramatically and there’s more evidence on the ground to help you see that this community is on the rise with a little help from ice hockey stars and spicy hot chicken. 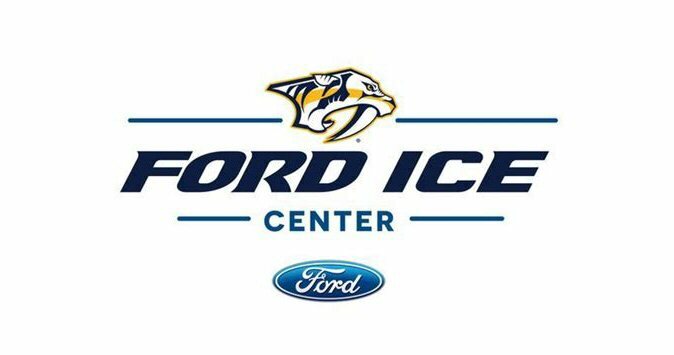 The coolest destination in Antioch – the Ford Ice Center. Near the hollow shell of the old Hickory Hollow Mall (now Global Crossings) sits the Ford Ice Center – a modern skating facility with a twin ice rink that opened to much fanfare in 2014. This $14 million project was constructed in conjunction between a partnership of the city of Nashville, Metro Sports Authority and the NHL’s Predators. The building features the blue and yellow color scheme of Music City’s hockey heroes and they have made it a point to visit frequently for special meet and greets and team practices. Most recently, the pack of Predators descended on the region to sharpen their skills on Monday, January 2, 2017 before a big game against the Montreal Canadiens at the Bridgestone Arena later in the week. The one-hour event drew a standing room audience who watched with awe as these professional athletes went through drills they’ve been conducting their whole lives at every level of the sport. Predators players and their mascot Gnash took time out to meet the fans. The players opened with a salvo of slap shots that ricocheted off the Ford Center’s glass barrier as pings loudly rang throughout the complex. Several two on two and three on three match-ups followed that allowed both the defensive and offensive sides to get some work in. Often, a puck chased deep into the corner resulted in some careening and crashing into the boards. Even though this was an inter-squad practice powerful brute force and physicality was on display. At times the session seemed like organized chaos while other moments revealed a more purposeful focus underway. Most fans were just happy to be in the presence of the Predators who were glad to stop and sign autographs on their way out of the rink. 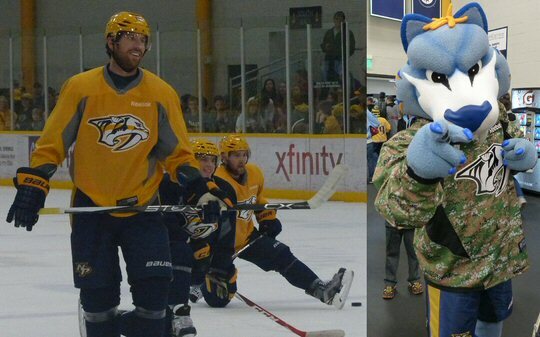 For younger admirers the Nashville mascot Gnash was on hand to offer high fives and pose for pictures. Fans looking to warm up after a day on the ice need to look no further than four miles down the pike on Old Hickory Road at the intersection with 5814 Nolensville Road. That’s where the long-awaited second location of the legendary Nashville restaurant has opened as Prince’s Hot Chicken South. Prince’s Hot Chicken Shack is a restaurant founded in Nashville, Tennessee, known for its award-winning hot chicken. The business – started in 1945 by one James Thornton Prince – consistently rises to the top of the “best restaurant in town” lists and since it’s opening we discovered why. 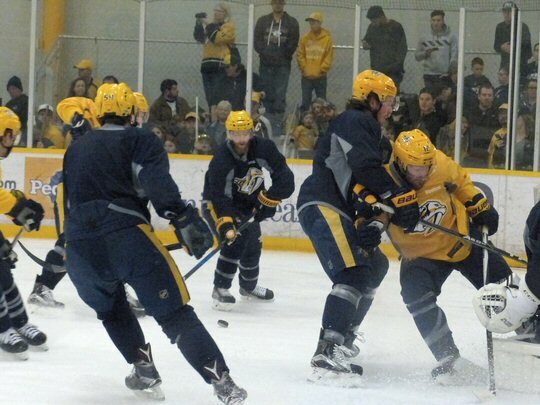 Organized chaos as the Preds prepped for their match against the Canadiens. On any given week representatives from MusicCityNashville.net will make the pilgrimage to Prince’s for their succulent set of hot chicken tenders. Even their lowest level “mild” variety will draw sweat to your brow as you dive in for your next bite. However, how people ever attempt the top-level XXXHOT is beyond us. 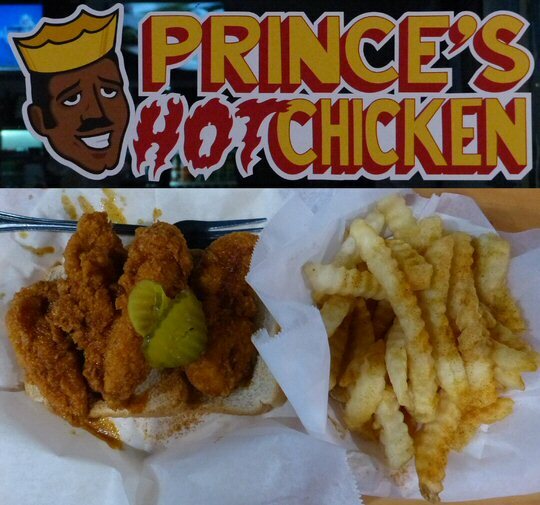 Prince’s also specializes in hot chicken on the bone and party orders of hot wings. Ample sides including our favorite spicy fries are available a la carte. If you haven’t had the pleasure yet of trying the hot taste sensation that is Prince’s they’ve taken their show on the road via the new Prince’s food truck. They’re sure to roll up on all the best events in town making the hot attractions in Nashville that much hotter. Mouth watering hot chicken is now a staple in South Nashville.